Marinate beef for 6 hours in the refrigerator. Save extra marinade. Broil beef in your oven for 17 to 18 minutes, turning once. Remove from the oven and let stand for 10 minutes. Carve into thin slices. 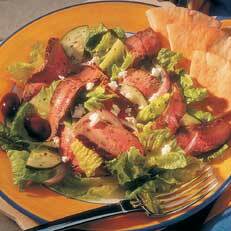 Combine the salad ingredients with the beef and toss with the reserved marinade. Sprinkle with cheese and olives and serve. Grass fed organic beef is the healthiest way to consume beef which is high in the amino acid Methionine. Methionine aids the body with blood sugar regulation. Olives are high in vitamin E which is the body’s most powerful fat soluble antioxidant. Feta is made from goat milk and is easier to digest than cow dairy.